It is common for local street and road pavements to be constructed from portland cement concrete (PCC) supported on natural subgrade without considering subgrade treatment or structural support layers such as granular subbase. When support layers are considered, they typically only serve as a construction platform. Incorporation of support layers or subgrade treatment in design has the potential to improve the level of stability and uniformity for the pavement foundation which can result in increased performance and thus increased pavement life. A granular subbase, for example, can improve the drainage under the pavement slab, which helps prevent water entrapment in concrete joints which minimizes joint deterioration. 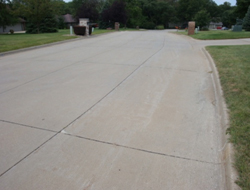 Mechanical or chemical subgrade stabilization can improve the long-term durability of the layer. When designing a PCC pavement and foundation system, it is important to consider the life cycle cost of the pavement. Costs include maintenance over the life of the pavement in addition to the construction cost. It has been stated that improvement to the pavement’s subgrade and subbase layers will extend pavement life, (Design Guide for Subgrades and Subbases (TR-525)). Therefore, based on that study, the life cycle costs of a pavement placed on subbase or on treated subgrade should be lower than that of a pavement on natural untreated subgrade. The life cycle costs should be evaluated over a period of 30 to 50 years based on the needs of the jurisdiction. The outcome from this analysis will be conclusive information on how to design and build PCC pavement systems for local street and road systems. The conditions need to be studied in both the rural and urban settings. For new paving in the counties, it is typical to remove the existing gravel surface and use it for shoulders leaving a soil-aggregate subbase. The aggregate is typically a class c material, and the value of the material should be optimized as a subbase layer where possible. 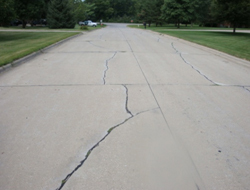 In the cities, pavement support issues are often related to utility trenches that are not compacted properly. It is important to construct these areas properly prior to the placement of pavement to ensure long term performance. It is critical to understand how to optimize the use of concrete pavement support layers to provide the most economical life cycle cost of the pavement system and minimize public funds expenditures on local roads.